We are happy to offer you accommodation with “the best location” next to Lincoln Road and only a couple of blocks to Ocean Drive in South Beach Miami Art Deco District. This location is right on the beach right next door famous SKY bar & Delano designed by Philip Starck and owned by famous Ian Schregger (from NY Studio 54). Enjoy a full service upscale condo-hotel with 24h security. You also have a door man to greet and open the door for you on daily basis. There are 4 elevators, bars, restaurant, Café, Jr Olympic size swimming pool, Jacuzzi and private beach access at your convenience. Our unit is in the heart of South Beach where you can walk to just about everything without having to take a taxi. Within about 100 yards you have the world’s most famous restaurant & lounges. There are 2 private entrances to the bathroom that gives privacy. The condo is located on one of the higher floors with a partial ocean view, tucked away from any night club noise of Collins Ave. Property has a beautiful pool with direct beach access! Shelborne is a condo-hotel where all units are individually owned and some owners leave their unit in the hotel rental pool and others rent out themselves. We manage our own units to give you more value, more luxurious interiors with lots of upgrades and give you more space for your money. All guests and residents at the Shelborne have full access to all resort facilities such as pool, Jacuzzi, café, restaurants and bars. Enjoy the Greatest Location on the Beach in the Heart of South Beach! Enjoy forever views from your beachfront condo in this beautifully restored 1940's condo-hotel, situated in the heart of Miami Beach's famous South Beach Deco District. The all-new Shelborne Condominium is located directly on the ocean in the world famous South Beach. Conveniently located in Miami Beach's historic Art Deco District, the "Ocean Beach Studio" at Shelborne offers a luxurious accommodation to suit any needs. 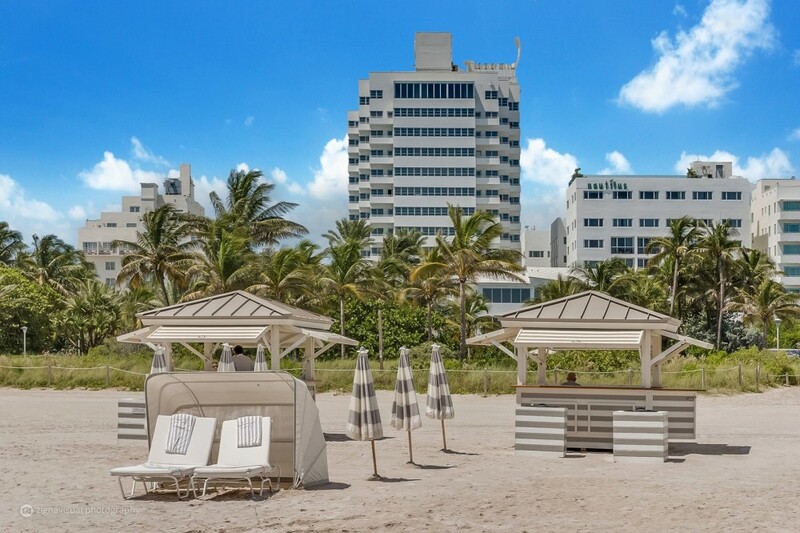 Whether you want a weekend in the tropical paradise South Beach Miami or need accommodations and an elegant Art Deco location for your business or leisure, this "Ocean Beach Condo" is ready to accommodate you. Location is right on the beach on 1801 Collins Avenue, Miami Beach, FL, 33139, US with walking distance to everything. Shelborne Ocean Beach Resort is home to the famous MTV MODELS in current Model Reality Show: 8th & Ocean. Awake to a magnificent sunrise over the Atlantic Ocean. Relax on the most beautiful and scenic warm water beaches in South Florida... Shop on Ocean Drive and Lincoln Road... Experience sizzling nightlife in Miami's South Beach... All this and more await you at the Ocean Beach Condo at Shelborne. The South Florida hospitality, along with the Miami Beach sun, sand, and surf, attracted guests from all over. Indeed, the Shelborne enjoyed almost mythical status in the 1940's, 50's, and 60's. It was home to the Miss America and Miss Universe Pageants, and was a home away from home for some of America's biggest stars. We cannot stop telling people that please remember that the real cool lounges and night clubs are on/next to Collins Ave in between 16th – 23rd Street such as Delano, Sky Bar, Mynt, Vita, Set, The W, Sagamore, Raleigh, etc. This unit is in the heart of South Beach where you can walk to just about everything without having to take a taxi. Within about 100 yards you have world famous restaurant & lounges such as: Sky Bar (on 20th Street), Mynt (on 19th Street), Baoli-Vita (on 19th Street), Setai (on 20th Street), Nobu (on 19th Street), Setai (on 20th Street), Raleigh (on 18th Street), Florida Room (on 17th Street), Rose Bar (on 17th Street), Plat Blue (on 17th Street), Blue Door Fish (on 17th Street). A few other world class places in the about 300 yards away are: Mr Chow at W (on 23rd Street), Living Room at W (on 23rd Street), The Wall (on 23rd Street) and Mokai (on 23rd Street). The Property can be used for RESIDENTIAL PURPOSES ONLY. The Guest and anyone in the Property must respect all rules and restrictions that apply on the premises in this agreement. All properties are NON SMOKING. Should a Guest violate this policy, Agent reserves its right to charge said Guest any additional costs required to sanitize the Property). Each Guest agrees to obey and follow all the rules that correspond to the specified Property. Should Guests disrespect owner’s rules and regulations (including smoking restrictions), this agreement contract will be terminated, all payments will be forfeited, and Guests will vacate the Property immediately.. Regular Check In time (without exception) is 5:00 p.m. This is needed to give cleaning crew enough time to clean after previous Guests and prior to guest check-in. Check Out time is no later than 11:00 a.m. because unit has to be cleaned for other arriving Guests later in the afternoon. Agent uses its best efforts to have guest home ready for guest at check-in time, but cannot guarantee the exact time of occupancy. If it is possible to check in earlier property care taker will try to accommodate the Guest but cannot guarantee anything earlier. The Guest will indemnify Owner, Property care taker and/or Agent save it harmless from and against any and all claims, actions, damages, liability and expenses, including attorney's fees and costs, in connection with loss of life, personal injury, and/or damage to Property arising from or out of the occupancy or use by Guest or his/her Guest of the premises or any part thereof, occasioned wholly or in part by an act or omission of Guests, its Agents, contractors or employees. Ultimately, Guests acknowledge that they use the Property in its entirety (including indoors, space, garden, swimming pool, Jacuzzi, decks and docks) at their own risk and agree to hold harmless the owners or its Agents from any lawsuit. This indemnity shall remain in full force and effect after the termination of the Guests visit, meaning that, after the departure date, Guest will not hold owners or its Agents responsible for damages or losses incurred during their stay. If Property is equipped with alarm system, it is the responsibility of the Guest to activate the alarm each time and every time they leave the house. Should Guests fail to activate the alarm monitoring system before leaving the Property, and should the Property be vandalized or burglarized, Guests will be held financially responsible for any and all costs incurred to restore the Property, as well as any and all replacement costs for stolen items. All Guests acknowledge that Agent is a transaction facilitator and serves as a reservation center only and does not own the unit being rented. The responsibility for maintenance lies with the Property care taker of the Property. Agent will also assist Guests to help and solve any issues to the best of its abilities. Guests understand and agree that owner, trust, manager or Agent of Property is held free and clear, and not liable for any accident, damage, or pain inflicted on any Guest. All Guest or occupants of Property hereby waive and release any rights to seek legal claim -, chargebacks, suits-, complaints-, discounts- or refunds to be bought upon trust, owner, manager, Agent or Property for any reason. All rates and reservation requests must get approval by the owner or management prior to being able to be confirmed. Usually a booking confirmation email is sent out within 24 hours after down payment has been made. If a rate quoted was incorrect and not approved by owner you will not be charged or down payment will be refunded. Management reserve the right to correct or adjust any error in pricing (after confirming availability and rate with the owner) prior to booking confirmation has been emailed. No booking is confirmed until you have received a Confirmation E-mail stating your reservation is booked and confirmed. By paying a down payment guest hereby agree to the terms and conditions in this agreement. By paying guest down payment guest hereby agree to the terms and conditions in this agreement. The down payment has to be paid the same day as making guest reservation or it will be cancelled without notice. - Guest reservation is confirmed after agent have received guest down payment and sent guest a confirmation E-mail. Should agent not receive the full payment on time, (unless guest book last minute past the final amount due date) guest reservation will be cancelled. Failure to pay guest full balance is considered a breach of contract and is a cause of contract termination. In this case Guests will forfeit all moneys paid.